This Hubble Space Telescope composite image shows a ghostly "ring" of dark matter in the galaxy cluster Cl 0024+17 in this stunning space wallpaper. The ring-like structure is evident in the blue map of the cluster's dark matter distribution. 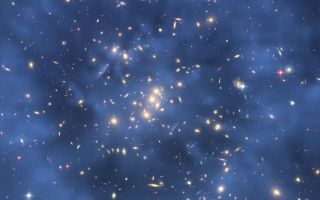 The map is superimposed on a Hubble image of the cluster. The ring is one of the strongest pieces of evidence to date for the existence of dark matter, an unknown substance that pervades the universe.